World Wide Waftage - Wafting Through Our World Wide Travels with Ease, Joy and Simplicity: Medical concern, off to hospital...Check out the "year ago photo" below!...Outstanding sighting! Medical concern, off to hospital...Check out the "year ago photo" below!...Outstanding sighting! Many refer to impalas as "McDonald's "due to the big "M" on their backside and...how they provide ample meals for the big cats. Mr. Monitor Lizard says, "Pool time!" Over the past few hours, I've been deliberating over whether or not to mention a health concern I'm facing at this time. After careful consideration, and many discussions between Tom and I, we decided to go ahead and tell this story as it unfolds over the next several days. Why reveal such a personal scenario? I'm not looking for sympathy, empathy or attention. Our lives are filled with wonderful feelings and experiences. These particular words don't necessarily fall into a category of words that typically apply to us. If we wanted attention, we'd go on TV and tell our story. But, we prefer to live our lives of world travel with all of YOU who, with such dedication, have followed along with us all of these years. Your warmth, kindness, and support are all we ever need to fulfill us in writing this daily story and photos of our experiences. Subsequently, we decided to tell this story in hopes that if only one person reads it and learns something from it that may ultimately inspire them to improve their own health, this personal expose will have been worthwhile. At times, people ask, "How can you let everyone in our your personal business?" When we began posting we knew we were going to forfeit a part of our private selves. Simply writing about places we've been, restaurants in which we've dined, animals we've observed in the wild and cultures we've explored in many lands, would make us similar to the zillions of travel logs and blogs so readily available online. We wanted to touch upon the "human side," of world travel, the pros and cons, the ups and downs and often our own personal foibles of which we have many and freely express here. At times, our vulnerability is deafening, even in our own ears. At times, these lone males wander and graze the bush in small or large herds, known as an "implausibility." Thus, tomorrow morning we're driving to Nelspruit to stay in a hotel near the hospital for my 8:00 am cardiology appointment with one of the top cardiology specialists in South Africa. (After all, it was South Africa where Dr. Christiaan Barnard performed the first heart transplant in December 1967). This morning, I had an exercise stress test with Dr. Theo Stonkquist in Komatipoort, one of the finest doctors I've ever met. At the end of the test which I'd thought I'd passed with flying colors, breezing through the process, Dr. Theo informed me the test indicates I have a blocked artery. All my life, I've made every effort to stay healthy when I witness many family members falling prey to many conditions including considerable diabetic and heart-related conditions. I stayed slim, exercised, ate a healthy diet and did everything I could to avert such a possibility. As we now know from science, our genes are more powerful than our dreams of good health. This implausibility appears to be females and their young. In minutes, Dr. Theo reached his most highly regarded colleague in Nelspruit (after sending him my results) and immediately made an appointment for me for Monday morning at 8:00 am. We've already booked a hotel near the hospital and will make the drive tomorrow (Sunday), stay overnight at the hotel and be only minutes from the hospital on Monday morning. Most likely, I'll be in hospital overnight. I'll have a battery of scans and tests after which a decision will be made as to the next step which could result in an angiogram and stent. I'm hanging onto the hope that I may fall into the 25% margin of error category based on the stress test I had today. 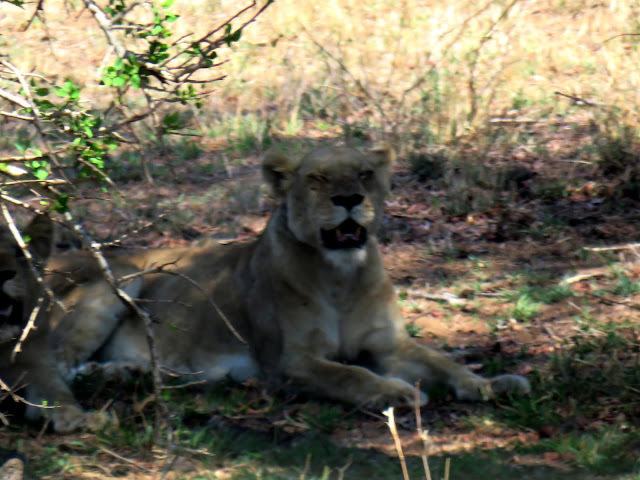 A female lion at a distance in Kruger National Park. However, with awful recurring pain, I've had in my jaws for weeks which the doc thinks is angina, I'm not overly optimistic that I'll fall into that 25% margin of error. As a matter of fact, it was that very intermittent fierce jaw pain that prompted me to go see Dr. Theo on Thursday. We'll see how it goes. There's good WiFi at the hospital and surely, if I'm able, I will do a post on Monday after the tests, albeit short with updates. Please understand I may not be able to post if the tests or procedures continue longer than expected. In that case, most likely, there will be a short post, before the end of the day on Monday or sometime on Tuesday. Am I scared? Sure. I'd be a fool to say this is not frightening. I have no doubt many of you reading this, who have been through a similar situation in the past, were apprehensive and a bit frightened. Dr. Theo prescribed three medications for me to aid in preventing a heart attack which I started immediately (including nitroglycerin in the event of a problem). If optimism and positive thinking were a certainty for a good outcome, many of us would never worry about a thing. But, we're human, we're infallible and we're subject to emotions ingrained in us to protect; ourselves, our loved ones; and the world around us. Be well! Be healthy and carry on! The captain maneuvered the ship so we could see this in more detail. This was a stunning sighting...Chinstrap Penguins on an iceberg! For more Antarctica photos, please click here.